Millcreek Herbs LLC - Herb Articles - Healthcare: Managing Your Blood Sugar - Dedicated to the understanding, wise use and enjoyment of herbs. 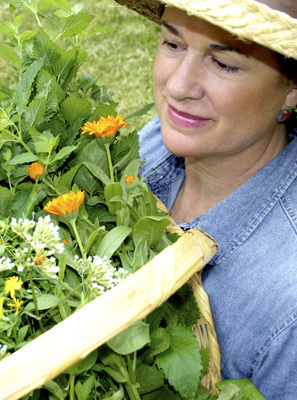 Merry's articles and herbs research will help you to learn more about medicinal herbs, culinary herbs and the wellness benefits of Complimentary Alternative Medicine (CAM). I just had my annual checkup and blood test. Everything is normal except for my glucose which is 99, at the extreme high of normal. (The range is 85-99.) The doctor recommends eliminating sugar from my diet and getting regular exercise before resorting to medication to control it. Are there any herbs that can help keep blood sugar normal? Blood sugar levels are a common concern nowadays with the dramatic rise in obesity and increase in the number of people, young and old, diagnosed with diabetes. Changing farming methods, increased consumption of cultivated grains and the development of diabetes seem to be correlated in history. Ancient Egyptians were afflicted with it, and its occurrence increased in Europe with the importation of sugar in the 1600s. Before I give you the names of the herbs that might help you manage your blood sugar, I'd like to go through some information that can help you determine how great your risk remains for elevated blood glucose. Is your elevated reading high because you are overweight and eat a diet high in sugars, carbohydrates and refined foods? If so, there's a very good chance that you could bring down your blood glucose level by putting the suggested preventive measures in place and adhering to a regimen of regular vigorous exercise and a wholefoods diet low in grains, flours and sugars of all kinds including honey, fructose, syrups and alcohol. Eating a breakfast high in protein and low in carbs is a helpful way to begin your day. Wild Oats offers a useful free booklet that tells you how many carbs and how much protein grains and legumes have. For example, barley and quinoa are high in protein compared to white rice. Get a glycemic index chart from the pharmacy or online. It tells you which foods are highest in sugar so you can make careful dietary choices. You may be surprised to learn that a baked potato carries a high glycemic load. You must read food package labels to see if what you are buying contains added sugar. Yogurt is good for you, but check out the grams of sugar in a small fruit yogurt serving. Some have as much as a soft drink, between 25-30 added grams of sugar. Reading labels can help you eliminate lots of unwanted sugar from your diet. Restoring macro and micronutrients to the body will diminish cravings. I like to recommend Millcreek Herbs' Nutritional Tea of dandelion, oat straw and nettle to insure good minerals. The right ratio of essential fatty acids like omega 3 (fish oil), omega 6 (flax oil), and omega 7 and 9 are important, as are supplementation of chromiun nicotinate and magnesium citrate. If you think the doctor's recommended approach is not working or is not manageable, and you don't see the results you hoped for, there is a condition called insulin resistance that you may want to learn more about. Glucose is the energy source for most cells. Insulin is produced by the pancreas and regulates blood glucose levels by acting like a key to allow glucose to enter a cell to be used for energy or fuel. Insulin also informs fat cells to increase storage. Under normal conditions, when the nutrients are cleared from the blood after a meal, the pancreas stops secreting insulin. Insulin resistance occurs when the insulin does not effectively unlock the cell so the pancreas just keeps pumping out insulin even if the cells already have plenty of glucose for energy. Another name for this is Syndrome X or metabolic syndrome. Doctors use the waist-to-hip ratio as an indicator of possible metabolic syndrome in patients: In men, a ratio greater than 0.9 or a waist over 40 inches is suspect. For women, a ratio greater than 0.75 or a waist measurement over 35 inches is the indicator. Elevated triglycerides and depressed HDL cholesterol (less than 40 for men and less than 50 for women) are also possible signs of this condition. Insulin resistance can lead to diabetes, and the health risk factors are significant: abdominal obesity, hypertension, abnormal cholesterol, sticky blood that clots easily, damage to arteries and tissues, systemic inflammation and more. Checking your family history for diabetes my also be an indicator of your level of risk. Now for the good news about herbs. Many herbs have been shown to be useful in managing, and even reducing, blood sugar. Goats rue, Galega officinalis, contains guanidine and chromium. The glucose-lowering drug Metformin has the basic guanidine structure, and chromium is essential for proper glucose metabolism. The herb can easily be made into a tea. The leaves of blueberry, huckleberry, whortleberry and bilberry (Vaccinium spp.) have been used to lower blood sugar since Egyptian times, but I am not sure anyone understands the mechanism that makes the herb so effective. The fruit of blueberries is also useful; their high flavonoid content that helps to repair vascular damage caused by diabetes. Hyperinsulinemia, or high levels of insulin in the blood, occurs when the cellular messaging does not function properly to inform the body to stop excreting insulin when the cells have adequate glucose. This condition may or may not accompany loss of glycemic control. Some herbs have been shown to enhance insulin sensitivity, thereby diminishing excessive insulin output. This differs from some pharmaceuticals which stimulate more insulin production and secretion or inhibit production of glucose. There are several ginsengs, but one study suggested that only American ginseng, Panax quinquefolium, is effective in this manner. This herb may also improve energy so that one is more likely to feel like getting that much-needed exercise. I had always heard that the Ayurvedic herb bitter melon (Momordica charantia) was useful for diabetes. Not having it in my pharmacy, I knew little about it until one day at the farmer's market I saw one for sale and bought it. I understood its name when I steamed and ate it. It is extremely bitter as are many herbs recommended to lower blood sugar. Sources suggest consuming the unripe fruit (good luck). The dried fruit ground up in capsules is also recommended-a more palatable way to take this herb. Holy basil, Ocimum spp., is another Ayurvedic herb with a reputation for enhancing the cells' insulin sensitivity. Cinnamon is easy to come by and is effective at improving the cells' reaction to insulin in a variety of dose ranges. One can add it to common recipes like granola, applesauce, toast and drinks. Cactus, Opuntia spp., is very low on the glycemic index. It is good food, and in large doses, it increases insulin sensitivity. Locally, you can buy fresh cactus pads in the grocery store or preserved in jars in the Mexican food section. I like to chop it up and add it to chili recipes. It has sort of a slimy texture which I don't mind. If you live in the desert southwest where it grows in abundance, you can get lots of it fresh, and you can even go online to purchase cactus preparations and prickly pear juice which is delicious! Check with your healthcare professional to determine which approach to control your blood sugar levels is right for you. Because you are just borderline and do not yet require medication, it may be a reasonable approach to use herbs to help reduce your levels before resorting to medication, but also be sure to exercise and eat carefully to avoid added sugars. Now is a good time to put into practice as many methods of prevention as you can.